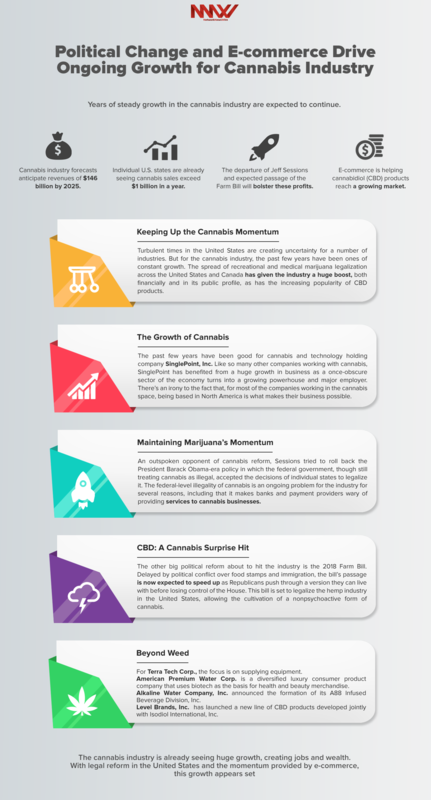 CannabisNewsWire Editorial Coverage: Years of steady growth in the cannabis industry are expected to continue. Turbulent times in the United States are creating uncertainty for a number of industries. But for the cannabis industry, the past few years have been ones of constant growth. The spread of recreational and medical marijuana legalization across the United States and Canada has given the industry a huge boost, both financially and in its public profile, as has the increasing popularity of CBD products. That growth is expected to continue, in large part thanks to the momentum from political change. The departure of U.S. Attorney General Jeff Sessions offers the possibility that the White House may finally commit to President Donald Trump’s electoral promise of cannabis policy reform at the federal level. Meanwhile, the Democratic majority in the House, together with the hemp clauses in this year’s Farm Bill renewal, set the stage to make life easier for those looking to support the American hemp industry. The past few years have been good for cannabis and technology holding company SinglePoint, Inc. (OTCQB: SING). Like so many other companies working with cannabis, SinglePoint has benefited from a huge growth in business as a once-obscure sector of the economy turns into a growing powerhouse and major employer. There’s an irony to the fact that, for most of the companies working in the cannabis space, being based in North America is what makes their business possible. Thirty years ago, this was the headquarters of the war on drugs — the U.S. government’s attempt to wipe out the cannabis industry alongside those producing and distributing other drugs. Now the United States and Canada are the world’s biggest markets for legal cannabis as reformers work to take pot profits away from criminal gangs and to bolster public health through a legal, well-regulated industry. As of this year, cannabis is legal for medical consumption in two-thirds of U.S. states and for recreational use in a fifth of them. Recreational use became legal in Canada a month ago — the first G8 country to make such a move. This step forward has created a huge market for companies such as SinglePoint to tap into, with Colorado alone expecting to see a billion dollars of cannabis sales by the end of 2018. This growth isn’t limited to cultivators and retailers, the obvious face of the cannabis industry. Those businesses need support services and infrastructure to do their work. SinglePoint provides a wide range of tech solutions tailored to the sector, including software to measure cultivation, track deliveries and make payments. Other businesses provide nutrients, hydroponic equipment and advisory services to the burgeoning cannabis sector. This also means a growing number of jobs. These are diverse opportunities as well, with many of them involving specialist skills and training from bud tending to compliance, not to mention the coders crafting SinglePoint’s software. During a reporting period between January 2017 and July 2018, the number of job listings in the industry rose by a staggering 690 percent. And the global market is expected to exceed $146 billion in revenues by the end of 2025, driven in large part by events in North America. One of the most significant events of the past few weeks for the cannabis industry’s prospects has been the resignation of U.S. Attorney General Jeff Sessions. An outspoken opponent of cannabis reform, Sessions tried to roll back the President Barack Obama-era policy in which the federal government, though still treating cannabis as illegal, accepted the decisions of individual states to legalize it. The federal-level illegality of cannabis is an ongoing problem for the industry for several reasons, including that it makes banks and payment providers wary of providing services to cannabis businesses. Companies such as SinglePoint offer alternative payment solutions, but federal laws still limit the options. Sessions’ departure may create a real potential for change. The other big political reform about to hit the industry is the 2018 Farm Bill. Delayed by political conflict over food stamps and immigration, the bill’s passage is now expected to speed up as Republicans push through a version they can live with before losing control of the House. This bill is set to legalize the hemp industry in the United States, allowing the cultivation of a nonpsychoactive form of cannabis. Hemp promises to be a big cash crop. CBD oil extracted from hemp is used in a wide range of health and wellness products, such as the CBD water and tinctures recently released through SinglePoint’s SingleSeed site. The CBD side of the industry reaches markets that raw cannabis can’t and, as a result, has seen huge growth, spreading into health stores and international markets. But it’s through e-commerce that CBD has really taken off. More than $4 million of CBD products were sold through Amazon just in July this year. For companies, such as SinglePoint, that are using their own e-commerce stores, there’s even greater potential for profit than through Amazon. By providing both the product and the marketplace, they create a complete funnel to customers, benefitting from all the profits and building a loyal client base. As SinglePoint’s software and the growth of the CBD market show, the cannabis industry is about far more than just selling weed. For Terra Tech Corp. (OTCQX: TRTC), the focus is on supplying equipment. A producer of cultivation equipment such as hydroponics and moving tables, Terra Tech provides cannabis growers with the tools they need to grow rich, profitable crops. The growth of the industry has increased sales for hydroponics companies, a trend that’s expected to continue. Terra Tech is investing heavily in a hydroponics provider to reduce its costs and improve its ability to ensure supplies to growers. The growing popularity of CBD has drawn in companies from outside the cannabis industry as well. American Premium Water Corp. (OTC: HIPH) is a diversified luxury consumer product company that uses biotech as the basis for health and beauty merchandise. It has produced a CBD-infused drink — Lalpina CBD water — that makes it one of the first to turn CBD into a widely available edible product. Alkaline Water Company, Inc. (OTCQB: WTER) (TSX.V: WTER) announced the formation of its A88 Infused Beverage Division, Inc. The company currently offers products trademarked Alkaline88 that are available in more than 40,000 retail locations across the United States, including 39 of the top 50 grocers in the country. The new division — A88 — will focus on brand extension and product innovations in the healthful water category, with plans to offer a hemp-derived, CBD-infused Alkaline88 water product. Level Brands, Inc. (NYSE American: LEVB) has launched a new line of CBD products developed jointly with Isodiol International, Inc. The products include CBD oral sprays marketed under kathy ireland® Health & Wellness; CBD edibles marketed under Chef Andre Carthen Edibles; and a CBD pain-relieving cream available under Ireland Men One, a men’s lifestyle brand focused on millennials. The cannabis industry is already seeing huge growth, creating jobs and wealth. With legal reform in the United States and the momentum provided by e-commerce, this growth appears set to continue for a long time to come.